What does anti-Semitism look like in Europe in 2018? It's a 17-year-old boy, too frightened to wear a kippa (a religious skullcap) on the streets of Paris. It's an Israeli restaurant owner in Berlin who is told that he will end up in the gas chambers. It's a 24-year-old Austrian who knows nothing about the Holocaust. It's the armed guards outside synagogues and Jewish schools across much of Europe. It's the online chat rooms where people peddle conspiracy theories that Jewish "globalists" run the world. It can be violent or subtle. Overt or insidious. Political or personal. It can come from the right or the left. It exists in countries that have large Jewish populations, like France, and it also flourishes in places with smaller Jewish communities, like Poland. But one thing is clear. Anti-Semitism is alive and well across Europe. 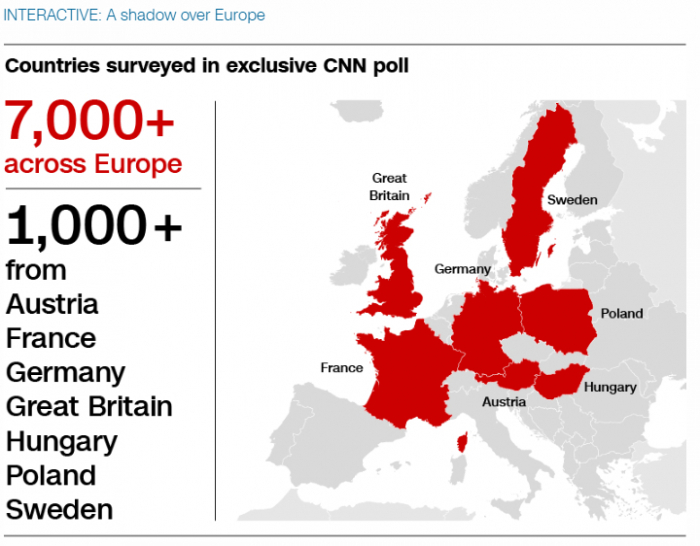 This was the glaring conclusion of a CNN investigation, based in part on a survey of more than 7,000 adults across seven European countries. Despite Europe's troubling history with anti-Semitism, ugly, old stereotypes persist across the continent. More than a quarter of Europeans surveyed believe Jews have too much influence in business and finance. One in five say they have too much influence in media and politics. In individual countries the numbers are often higher: 42% of Hungarians think Jews have too much influence in finance and business across the world. While 44% of Europeans agree that anti-Semitism is a growing problem, a substantial minority is unsympathetic to the problem. Almost one in five (18%) agree that most anti-Semitism in their country is a response to the "everyday behavior of Jewish people." In Poland, 50% of people think that Jews use the Holocaust to advance their position; 19% of Hungarians admit to having an unfavorable impression of Jews altogether. So why is anti-Semitism a growing phenomenon once again? Poland's Chief Rabbi, Brooklyn-born Michael Schudrich, is not sure the problem ever really went away. "The feeling beforehand was, 'This is what I believe but don't tell anyone.' It was not perfect but at least there was a social taboo against anti-Semitism." CNN saw this at first hand in Germany, a country still haunted by the killing of some six million Jews at the hands of the Nazis during the Holocaust. Making anti-Semitic comments can be punishable under German law. 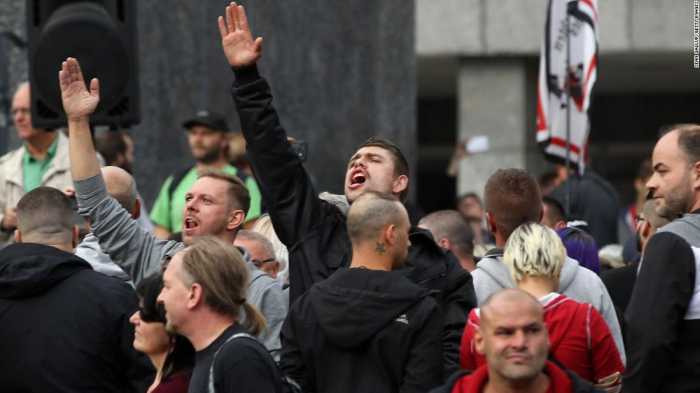 And yet, at a rally of hundreds of right-wing extremists in the nation's capital, Berlin, we saw a man brazenly flash a Nazi salute, an act that could have landed him up to three years in jail. Another protester told us that a shadowy cabal of Jewish globalists runs the world. The arrival of some 1.4 million refugees in Germany has energized the far right. The focus of their anger may be Muslim migrants, but they are reflexively anti-Semitic in their views. The Alternative for Germany (AfD) party, once considered a fringe element, now holds a solid 94 seats in parliament. Its message is clear: you don't have to be ashamed of being angry, you don't have to be ashamed of being white, you don't have to be ashamed of your past. But the rise of the far right is only part of the picture. Based on dozens of interviews with members of various Jewish communities across Europe, it is clear that the threat is being felt from many sides. In France, many Jews talk about the "new anti-Semitism," coming from radical elements of France's growing Muslim population, which can be felt on the streets of Paris' working-class suburbs. A happy life is a hidden life, we were told again and again by French Jews who refused to appear on camera. More and more Jewish families are moving out of these traditionally mixed neighborhoods -- a concern for the French government, which believes that integration, not separation, is key to improving the situation. In Germany, the leader of Berlin's Kahal Adass Jisroel community organization, Doron Rubin, told me there is also concern about anti-Semitism coming from Muslim refugees, "who have a different history and a different background, especially obviously coming from the Middle East, and who have, also because of Israel, a different attitude towards Jews." The nexus between negative attitudes toward Israel and anti-Semitism is a particularly thorny issue. More than a quarter of French people have a somewhat or significantly unfavorable impression of Jews as a result of the Israeli-Palestinian issue. This impression is by no means limited to Muslims. Across the continent, many Jews we interviewed spoke of anti-Semitism coming from the left, which is often strongly critical of Israel. Viewed as whole, it is a complex picture, made up of a confluence of different factors with no obvious, one-size-fits-all solution. Germany has appointed an anti-Semitsm czar, Felix Klein, who is working on creating a nationwide network for reporting anti-Semitsm and on improving education and integration in schools. Elsewhere, France is spending millions of dollars trying to combat anti-Semitic hate speech online. Many agree that Holocaust education is an important step. Half of Europeans say that commemorating the Holocaust helps to combat anti-Semitism. And yet, frighteningly, the memory of the Holocaust is starting to fade. More than a third of Europeans have either never heard of or know just a little about the Holocaust. That number is even higher when you look at the younger generation. In France, 20% of young adults have never even heard of the Holocaust. When I asked Rabbi Schudrich how he feels about these numbers, he paused a moment before responding, "It makes me feel I have more work to do." Clarissa Ward is an American television journalist who is currently chief international correspondent for CNN. Read the original article on CNN.